Get your adventure started on the right track by familiarizing yourself with Grand Bend before you head off. Grand Bend is 95 miles (153 kilometers) northeast of Detroit, a noteworthy city. Get a fantastic price on your vacation to Grand Bend by packaging your accommodation and airfare bookings. You can also choose from upwards of 400 partner airlines and 665,000 places to stay. Do you want a worry-free journey? Our Customer 1st Guarantee gives you the security of 24/7 personal assistance on all of our services. Have you stumbled upon a better deal? We'll meet the price and give you back the difference^. Don't you wish you had flexibility in you travel itinerary? All of our package bookings can be revised with no hidden fees or charges. And as long as you get in fast, many accommodations don't charge fees either^. If Grand Bend is on your travel itinerary, you'll have to look towards the surrounding areas for a place to sleep. Zurich has a variety of accommodations and is only 9 miles (14 kilometers) away. So it's time to grab your bags and run off on your next adventure! Where do you fly into for Grand Bend? Nothing's better than finally touching down in a brand new place. If you're going to Grand Bend, chances are you'll be disembarking at London International Airport (YXU). It's about 35 miles (56 kilometers) to the southeast of the downtown area. Grab your luggage and get set to start exploring! Can I rent a car in Grand Bend? Secure a rental car via Travelocity for your trip around Grand Bend. You're sure to discover some unique places while you're out on the road. Grab some cheese and a bottle of wine and spend a couple of hours at Grand Bend Beach. It's one of the most stunning spots in the area for a relaxing picnic. Like some more ideas? Theater can challenge our beliefs and asks us to aspire to higher things. Catch a performance at Huron Country Playhouse and expand your way of thinking. But that's not all. It's hard to conceive how people once functioned at home without all the technological gadgets we take for granted today. Peer behind the doors of Grand Bend’s Beach House Observation Deck and find out how they did. If you have a spare day or two and you're happy to travel 18 miles (29 kilometers), visit Bayfield. This nearby area has a world of things to see and do. The Huron County Library should be high on your list. Pioneer Park and Windmill Lake Wake & Eco Park are also excellent attractions. Want more options? Ilderton is 25 miles (40 kilometers) from Grand Bend. Visit this area for attractions including Masonville Place, the Bellamere Winery and Event Centre and the Museum of Ontario Archaeology. You have all the options in the world! 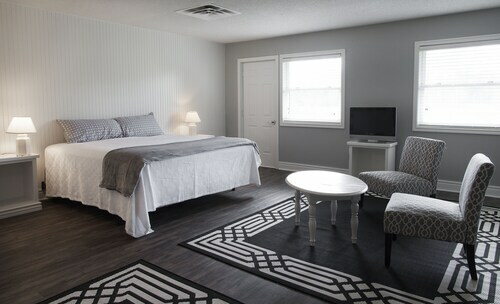 Nestled on the beach, this Grand Bend resort is within 1 mi (2 km) of Grand Bend Beach, Grand Bend Marina, and Grand Bend’s Beach House Observation Deck. Huron Country Playhouse and Grand Bend Motorplex are also within 3 mi (5 km). Situated on the Strip, this hotel is within 1 mi (2 km) of Grand Bend Marina, Grand Bend’s Beach House Observation Deck, and Grand Bend Beach. Huron Country Playhouse is 2.6 mi (4.1 km) away. Situated on a river, this hotel is within 1 mi (2 km) of Grand Bend Marina, Grand Bend’s Beach House Observation Deck, and Grand Bend Beach. Huron Country Playhouse and Grand Bend Motorplex are also within 3 mi (5 km). 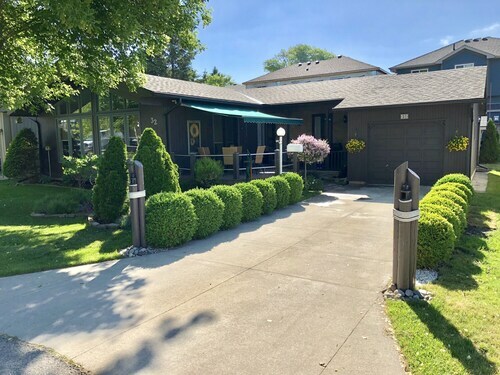 This family-friendly Grand Bend property is within 2 mi (3 km) of Grand Bend Marina, Grand Bend Beach, and Grand Bend’s Beach House Observation Deck. Huron Country Playhouse and Grand Bend Motorplex are also within 3 mi (5 km). 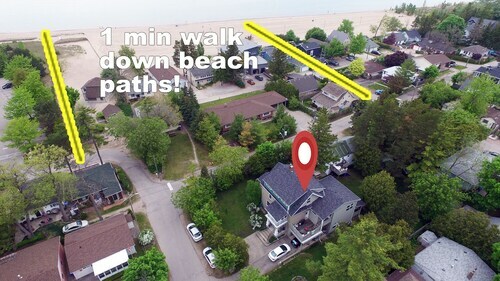 Situated in Grand Bend, this vacation home is within a 5-minute walk of Grand Bend Beach and Grand Bend’s Beach House Observation Deck. Grand Bend Marina and Huron Country Playhouse are also within 3 mi (5 km). This family-friendly Grand Bend vacation home is within a 10-minute walk of Grand Bend Beach and Grand Bend’s Beach House Observation Deck. Grand Bend Marina and Huron Country Playhouse are also within 3 mi (5 km). 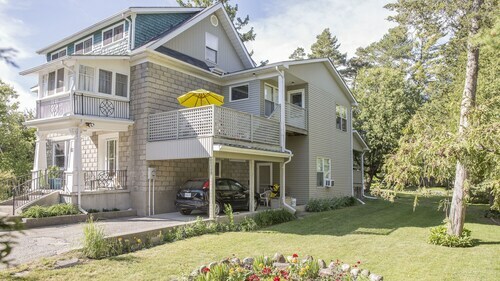 Offering direct access to the beach, this Bayfield hotel is next to a golf course and 1.3 mi (2.1 km) from Bayfield Community Centre.